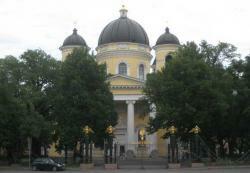 The Transfiguration Cathedral is situated in Pestel Street. In the 18th century on the place where the cathedral is standing now, there were the Headquarters of the Trans­figuration Regiment. The daughter of Peter I, Elizaveta Petrovna was proclaimed the Empress of Russia here. The Guards swore to her on the 25th of November 1741. Between 1743 and 1754 the cathedral was erected on this site. It was designed by the famous architect Mikhail Zemtsov. That cathedral was created in the baroque style. After the death of the architect Mikhail Zemtsov the con­struction was continued by the architect Pietro Trezzini, then Bartolomeo Rastrelli. Rastrelli created the project of the iconostasis. On the 5th of August 1754 the cathe­dral was sanctified. The ceremony was great. In 1825 this cathedral was burnt. On the place of the burnt cathedral between 1826 and 1829 the new cathedral was built. It was named the Trans­figuration Cathedral. It was constructed after the design of the architect Vasily Stasov in classical style. There are some famous works created by the archi­tect Vasily Stasov in St Petersburg. The most known structures are the Moscow Gates and the Holy Trinity Cathedral. The Moscow Gates were constructed in hon­our of the victorious ending of the Russian-Turkish War. It is one of the best works of Stasov. The Transfiguration Cathedral was the first military church of the Transfiguration Regiment. This regiment was the first Guards division established in Russia. In 1796 the temple was given the name “The Cathedral of All the Guards”. Stasov preserved the building’s former inner cruciform base. The architect reinforced the old walls and increased their height. He decorated the western facade of the ca­thedral with a four-column Ionic portico and a pediment. Besides, he added hemispheric contours to the central and the side cupolas. Stasov changed the interior of the cathedral a little. The magnificent iconostasis was created. It was embel­lished with the pilasters and Corinthian columns. These wooden decorations are the rarity models of the Russian artistic wood carving of the beginning of the 19th centu­ry. The icons of the iconostasis were painted by the art­ists Vasily Shebuev, Alexey Egorov and Alexander Ivanov. The walls and arches were painted after the drawings of the artist V. Shebuev. The reconstruction of the cathedral was over in 1829. On the 5th of August the cathedral was sanctified again. In 1832 the railing made from captured Turkish can­nons was erected around the cathedral. The main gates were crowned with bronze medals with the inscriptions “For the Turkish War of 1828-1829”.